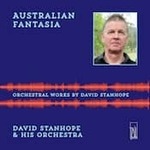 Australian Fantasia / David Stanhope & His Orchestra. David Stanhope 12 mins, 18 sec. David Stanhope 13 mins, 2 sec. David Stanhope 4 mins, 28 sec. David Stanhope 15 mins, 28 sec. David Stanhope 15 mins, 11 sec. Also includes: Étude-Tableau op. 39, no.5 / Rachmaninoff, arr. D. Stanhope -- Recessional / Grainger, arr. D. Stanhope -- Last Variation / Fauré, arr. D. Stanhope -- Hari Besaar (The Great Day) / Godowsky, arr. D. Stanhope. This CD presents orchestral works by David Stanhope and four of his transcriptions for orchestra. Except for Olympic Fireworks, which was part of the 2000 Sydney Olympic Games opening ceremony, all these works are hitherto unperformed in public. David Stanhope says "Few ears, even those of an expert, are likely to notice the difference between an actual orchestra and a digital one like my orchestra, if not told beforehand. But spotting flaws (which may be the absence of flaws!) is not the point. It is the music itself and its worth that matters most in creating digital performances that bring unknown or neglected music to life. It needs to be stressed that there is no intention to replace orchestras or their players by this project; it records music that cannot presently be heard because existing orchestras do not play it. The one should complement the other, and may lead to recognition and future performances." Stanhope is a renowned Australian conductor, noted for his many operatic performances and his recording and performing work with Australian orchestras. This project is part of his research for his doctorate and is a world-first in the international world of recording. Liner booklet includes programme notes and biographical information about composer. Score: Two folk-elegies / David Stanhope. Parts: Australian fantasia : concert band / David Stanhope. Score: Australian fantasia : for orchestra / David Stanhope. Score: Advance Australia fair : piano reduction, movement 4 only Australian fantasia / arranged by David Stanhope. Score: Australian fantasia : concert band / David Stanhope.